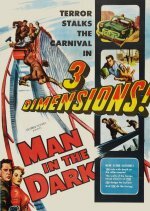 It's nothing more than a B-feature, but this crime melodrama was dressed up with two lesser stars (Edmond O'Brien and Audrey Totter) and rush-released as one of the first features in the 3D boom of 1953. Croydon was chosen as the location for its world premiere run; no doubt its inhabitants are talking about it to this day. Action director Lew Landers is out of his depth and overloads the picture with 3D gimmicks, but at least the climactic shoot-out on a rollercoaster track has some life. Viewed without the 3D novelty, the dreary plot becomes all the more prominent, while the prodding of objects at the audience is a real irritation.